* Telephone: 01-2166970 and select option 1 to speak with our Helpdesk for technical support. Here your call will be logged and acted upon immediately. The call will be logged in our system and an automated email communication will take place to confirm the logging, update details and resolution. This has been our tried and trusted method of Helpdesk support from day one and if its the best fit for you, don't worry - we have no intention of changing that. * Email: Send an email to helpdesk@gdk.ie (not support@gdk.ie) with your issue and availability for remote access if necessary. Again, your call will be automatically logged in our system and automated email communication will take place to confirm the logging, update details and resolution. This methods may suit some customers whose opportunities for telephone support are limited, or who wish to log a call outside of business hours. You could also use the form below to send us your support request. 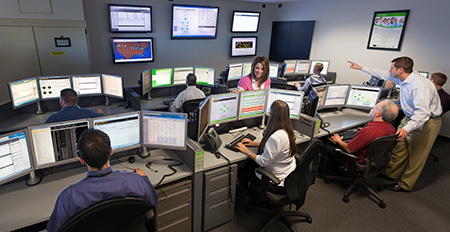 * Web Portal: As part of our new systems we are able to deliver Helpdesk access to our customers via a web based portal where the customer can login with their own unique user / password and from there log calls / add notes or updates to exiting calls / check the status of any open or closed calls. This service is configurable on demand so please call us to discuss this option. * System Tray Icon: (Available with our Monitored Networks Only):- Another improvement to our service offering in recent times is the introduction of Network Monitoring and as part of this service it allows us to deploy a System Tray Icon to each desktop which facilitates several features, one of which is a link directly to our "Helpdesk Support Request" form which will initiate a call on our system. Again, if this is something you might be interested in or wish to see a demonstration first hand please contact us on the Helpdesk and we can discuss further. These enhancement will benefit you as a valued GDK customer and we will be happy to discuss or advise on same or indeed any other queries you may have. Your request will be logged in the GDK Support Call System and you will receive confirmation shortly of same.